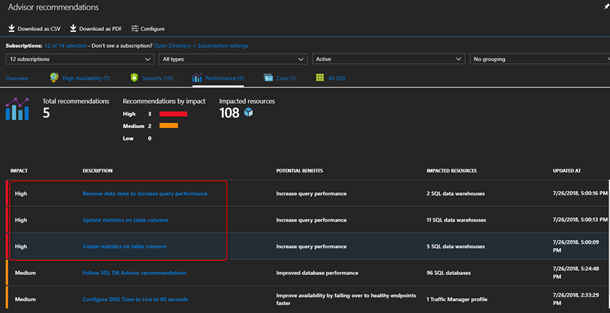 We are excited to announce that SQL Data Warehouse (SQL DW) serves you intelligent performance insights within the Azure portal! SQL DW is a flexible, secure, and fully managed analytics platform for the enterprise optimized for running complex queries fast across petabytes of data. 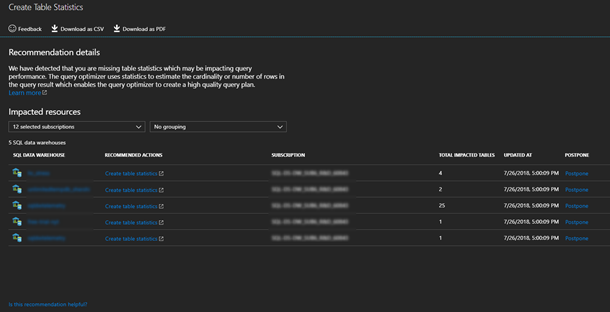 Continuously delivering on fully managed experiences, customers no longer need to monitor their data warehouse to detect data skew and suboptimal table statistics with this release. Data skew and suboptimal table statistics are common issues that can degrade the performance of your data warehouse if left unchecked. 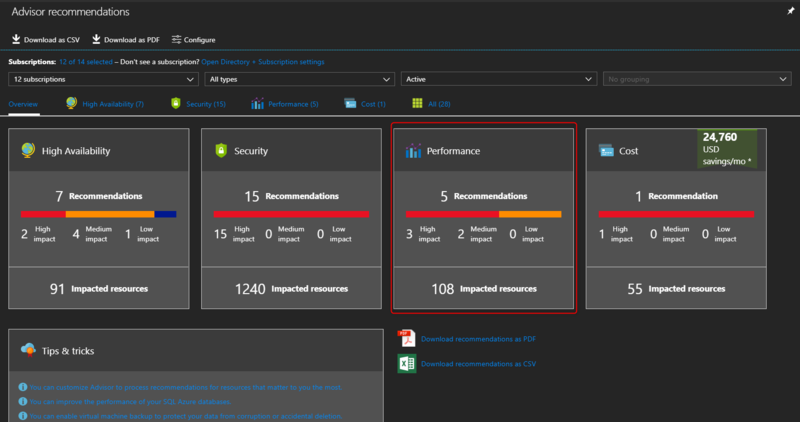 At no additional cost, SQL DW surfaces intelligent insights for all Gen2 data warehouses and is tightly integrated with Azure Advisor to deliver you best practice recommendations. SQL DW analyzes your data warehouse collecting telemetry and surfaces recommendations based on your active workload. This analysis happens on a daily cadence where you can download recommendations, configure certain subscriptions to be analyzed, or postpone recommendations from being generated. To generate these recommendations yourself, you can run the following T-SQL script and identify the specific tables being impacted by skew and statistics. 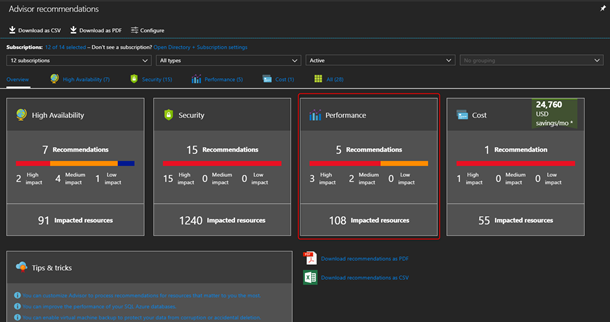 For feedback on recommendations, please reach out to sqldwadvisor@service.microsoft.com or click on the ‘Feedback’ button within the portal. Stay tuned for additional recommendations! Check if you have Advisor recommendations! Visit our online documentation for more details on recommendations with SQL DW. For feature requests, please vote on our UserVoice. 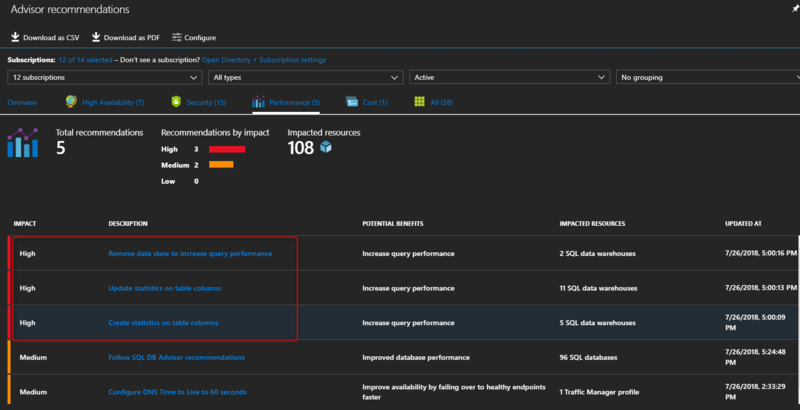 Create an Azure SQL Data Warehouse to get started today. Stay up-to-date on the latest Azure SQL Data Warehouse news and features by following us on Twitter @AzureSQLDW.